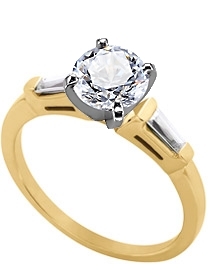 This is a 14k yellow gold traditional 3 mm engagement ring with baguette side stones. The ring is set with two channel set baguette diamonds, each approximately .12 carat with a color of G-H and a clarity of SI. One diamond is channel set on each shoulder of the ring for a total carat weight of .25 carats.